This is excerpt No. 19 (of 45) from America’s Right Turn: How Conservatives Used New and Alternative Media to Take Power, by Richard A. Viguerie and David Franke. Today we take it for granted that millions of Americans will contribute to political campaigns. We also take it for granted that hundreds of political organizations and committees – from right to left – will take an active part in these campaigns; and that hundreds of thousands of Americans will join in the efforts of those groups and contribute to them. All of this is democracy in action. We take it for granted, but it was not always so. It is a recent development, spanning a mere half century of our nation’s history. And direct mail is what gave us this modern world of mass citizen involvement in the political process. Direct mail greatly expanded the nation’s base of active citizenship and gave conservatives a voice in setting the nation’s political agenda. And thanks to direct mail, conservatives – and their candidates – were able to become an independent, vibrant force, free of the fetters imposed by the Republican political hierarchy and the liberal media. Direct mail also freed conservatives from dependence on the big corporations that had traditionally financed GOP and Democratic politics (and which expected to be paid back with favors). With these massive changes, American politics was irreversibly changed—and for the better. Political direct mail has created a revolution in America by greatly expanding the number of people who are actively involved in choosing their government. No longer do a handful of backroom politicians set the agenda, as they once did, telling us whom we can vote for in November. Voting is merely the last act in the process of selecting who governs us, and it is not the most decisive part of the process. By the time people vote at the polls in November, the candidates have been selected and the issues debated (or obfuscated). This is the most important part of the process because it determines what choices we have in November. And this is where direct mail has had its greatest impact: It gives conservatives a voice in setting the nation’s political agenda. Today we take it for granted that hundreds of thousands of Americans, even millions, will contribute to the campaign of at least one presidential candidate. And contributing your hard-earned money is much more of an active civic commitment than is answering a public opinion poll or watching the presidential debates on television. We also take it for granted that dozens, even hundreds, of political organizations and committees – from right to left – will take an active part in the campaign; and that hundreds of thousands of Americans will join in the efforts of those groups and contribute to them. All of this is democracy in action. We take it for granted, but it was not always so. It is a recent development, spanning a mere half century of our nation’s history. And direct mail is what gave us this modern world of mass citizen involvement in the political process. For more than four decades, hundreds of thousands of conservatives have become involved in countless political efforts through the medium of direct mail. The same process occurs on the Left, too – George McGovern’s presidential campaign and the lobbying efforts of the Sierra Club and Handgun Control, are examples. Citizens across the political spectrum have been empowered by direct mail. With this independence, conservatives could concentrate on advancing the conservative agenda rather than the Republican agenda. The two agendas most definitely were not always the same. Direct mail also helped conservative candidates remain independent of GOP institutional inertia. At that time the standard nomination and election procedure was for a potential candidate to be vetted by his local hierarchy, after putting in years of work doing the bidding of the party organization. By then, this potential candidate would be tamed, or perhaps “neutered” is the better word, and would pose no threat to the party hierarchy. For presidential candidates, the liberal mass media also expected to be part of the vetting process – and you can guess who would and would not get the media’s seal of approval. Direct mail changed all that. Conservative candidates learned to use direct mail to win election over the GOP hierarchy’s choices. “Look at the way presidential candidates were selected,” Keene says. They had to undergo vetting – with the collapse of the party system in the early ’70s – by journalists. There was actually a sort of track of dinners you had to go to, and if these couple of dozen journalists – David Broder and others – thought you were worth consideration, you could become a serious candidate. In those days, if you didn’t have any impact with ABC, NBC, CBS, the New York Times, the Washington Post and the Los Angeles Times, Time and Newsweek, you might as well forget it – you were out. Because there really was no other way to reach people on a mass basis. That sort of vetting veto is real political power, and explains why the establishment media have never been favorably disposed toward direct mail, which stripped them of that power, and why they could barely disguise their contempt for someone like Ronald Reagan, who rode the direct mail train to victory despite their disapproval. This is an aspect of direct mail and conservatism that is often ignored by the liberal media, which like to pretend that conservatives are the lapdogs of big business just because they believe in free markets. The truth, of course, is that it’s the liberals who are the major beneficiaries of big business largesse – either directly (the way environmental groups blackmail an oil giant like BP, for example) or indirectly through foundations (which were set up by super-wealthy individuals). The big corporations do not fund conservative groups. They fund liberal organizations. Necessity is the mother of invention, and out of necessity conservatives learned how to stay alive financially through direct mail. The truth is that big business has become far too cozy with big government. And big government, in turn, protects big business. It’s a sweetheart arrangement. Big business is comfortable with red tape, regulations, bureaucracy – these things freeze the status quo, impede newcomers, and hold down competition. If you see a business effort against stifling government regulations, you can bet it’s led by the National Federation of Independent Business and the other small-business groups that use direct mail themselves to mobilize support. Conservatives haven’t been successful in getting big business to stop funding liberal groups because (a) the Left poses more of a direct threat to the big corporations via boycotts, shareholder campaigns, and eco-terrorism; and (b) there are too many points of ideological divergence between grassroots conservatives and big business, whose leaders are more comfortable with the elitist social circles of Manhattan and Aspen than with traditionalist and religious conservatives. Where conservatives have been successful, however, is in guiding the political contributions of corporations in a more conservative, or at least Republican, direction. Because conservatives were able to wrest control of the GOP, the presidency, and much of Congress through direct mail, without significant corporate support, big business of necessity had to shift its political donations rightward in order to retain its influence in Washington. Call it Practical Politics 101. 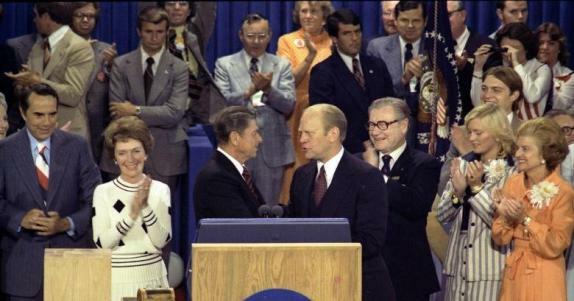 In the pivotal 1980 election, Ronald Reagan was at best the fifth choice of the big-business establishment Republicans. Their first, second, third, and fourth choices were Connolly, Bush, Dole, and Baker. Reagan won without their support, though, by utilizing direct mail and by tapping the conservative movement that had been built with direct mail. Reagan’s nomination and subsequent victory served as a riveting wake-up call to big business, and the results can be seen most directly with donations from the conduits of campaign funds, the political action committees (PACs). The important point to remember is that big business’s political support for liberals began to wane only after conservatives wrested control of the Republican Party by utilizing direct mail. Big business will play ball with anyone willing to play ball with them – be they conservative or liberal, Republican or Democrat, or communist for that matter. It was the independence generated by direct mail that propelled the conservatives into the ballpark. During the 1950s, 1960s, and most of the 1970s many politicians mastered the art of acting and voting liberal in Washington while sounding conservative to their constituents back home. They could return to their home districts on weekends and make speeches calling for a strong America, attacking waste in Washington, and complaining about big government. Then, on Monday, they could go back to Washington and vote to block new weapons systems, to give away the Panama Canal, to increase taxes, and to create new government agencies. Occasionally, liberal politicians would visit communist leaders like Fidel Castro and return to the United States with words of praise for the Cuban dictator, praise that most voters in South Dakota or Idaho never heard. Politicians could get away with this double life because most of the national (and some of the local) media weren’t about to expose them. If the end result was to advance the liberal agenda, then – the media reasoned – the end justifies the means. Direct mail exposed those cozy arrangements to the sunlight. Conservative political organizations and PACs could – and did – organize intensive mailings to constituents of a state or congressional district, letting them know the real voting records of their senators or representatives and making politicians’ duplicity an issue in campaigns. On any big issue, so many votes and parliamentary maneuvers are involved that a resourceful Washington politician can find something he did that will mollify the constituent. Indeed, he often arranges his votes so he can point to a “yea” vote and a “nay” vote, as needed. “But that isn’t as successful now as before,” Keene says, “because of the impact of the alternative media. Now, if you do something duplicitous like that, you risk being exposed.” The Internet has boosted the honesty-in-voting cause, but the exposure process began with direct mail.